Burke brings play to a community near you with the 2019 Great Play Giveaway. We love play and can’t wait to share it with an amazing Burke playground giveaway for parks, camps or recreation areas! BCI Burke is excited to announce Jeff Skoug, Recreation Supervisor, from the Village of Waunakee in Wisconsin as the winner of the Great Play Giveaway presented by Parks & Rec Business and Camp Business magazines! As the winner, the village will receive a brand-new Nucleus/Intensity playground valued at almost $30,000! “Playgrounds and parks play an important role in providing a space for families to be active, to socialize and get much-needed time outdoors,” said Michael Phelan, president and CEO of BCI Burke. “We are so happy to be able to partner with Northstar Publishing, Inc. and provide this community with a playground that will provide years of active enjoyment and development,” Phelan added. The village is planning to install the playground behind their community center to provide an additional place for children and families to gather and play. We are so excited to announce Gustavo Vergara, Culture and Leisure Services Director, from the City of Cape Canaveral as the winner of the Great Play Giveaway presented by Parks & Recreation Business and Camp Business Magazine! As the winner, the City will receive a brand-new Nucleus®/Intensity® playground valued at almost $30,000! As part of the third annual contest, all recreation departments and camps could enter to win a playground for their community that will help children develop skills that transcend the playground, including motor skills, cognitive planning and cooperation. Bringing play to communities is what moves us at Burke to come to work every day and drives our passion to develop the best products and design the most inspired playgrounds! Last year, we decided to partner with Parks & Recreation Business and Camp Business Magazine to giveaway a playground to a community! So much FUN! The Town of Shallotte, NC won a playground that fit perfectly into their plan to add to the playground already planned for Mulberry Park! For 2016, we decided to give away a bigger playground and update the name to the GreatER Play Giveaway! We are excited to announce the City of Powell as the WINNER of a brand-new Nucleus®/Intensity® playground valued at more than $28,000! We hope the City of Powell enjoys their new play equipment as much as we enjoyed providing it to them! The Town of Shallotte’s 10-acre Mulberry Park will be a more active play space thanks to Rachel Johnson, the Parks & Recreation and Business Promotional Coordinator for the Town of Shallotte! Rachel is the Grand Prize winner of the Great Play Giveaway, presented by Parks & Recreation Business and Camp Business Magazine. 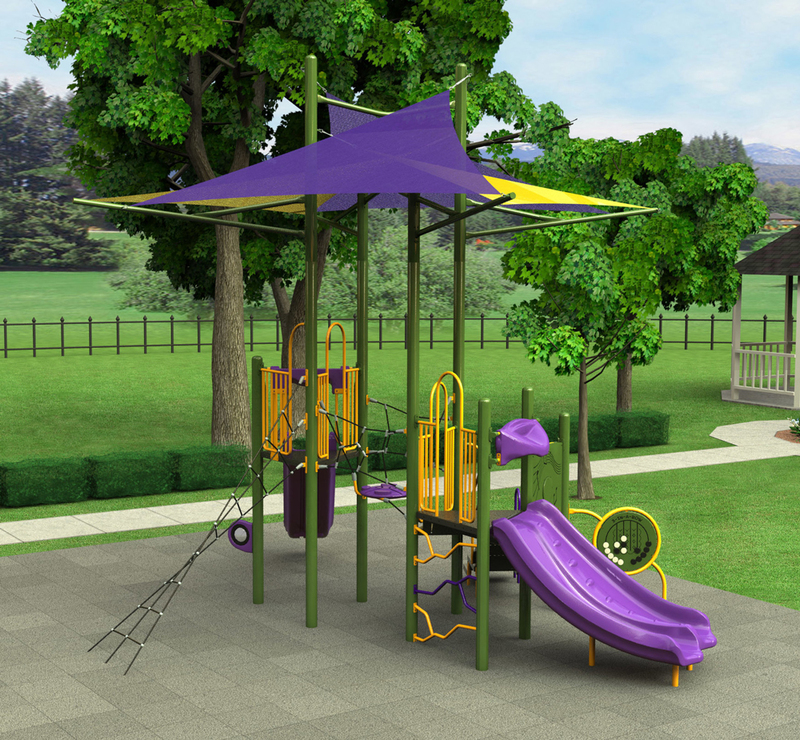 The Burke Intensity® playground she won includes all new play events from our fitness product line, which is designed to challenge and exercise children’s bodies while they play. A selection of climbers, spinners and overhead events make up this active and fun playground for families to enjoy while spending time together outdoors! “Playgrounds and parks can play an important role in providing a space for families to gather and get much-needed time outdoors,” said Michael Phelan, president and CEO of BCI Burke Company. “We are so happy to be able to partner with Northstar Publishing, Inc. and provide a deserving community with a playground that will provide hours of enjoyment,” Michael added. Rachel is excited to be able to help the Town of Shallotte get the park they hoped for! “I truly can’t express how thankful we are here at the Town of Shallotte and this couldn’t have come at a better time for us! We’ve been trying to figure out how we were going to fund the playground in our new park to the extent we wanted and winning this contest helps us create our dream playspace,” she said.